Many runners appreciated the excellent traction provided by the outsole. One user stated that the shoe had the perfect balance of performance, lateral stability, and protection. Some buyers were satisfied with the thick insole because it held the foot well inside the shoe and prevented any in-shoe slipping, thus enabling a relaxed run. A lot of users agreed with the comfort and the form-fitting coverage that the shoe gave. It is the most comfortable-fitting shoe of The North Face brand, as stated by one reviewer. One tester said that toe box felt roomier in comparison to other shoes from The North Face. Another mentioned that the midsole provided agreeable cushioning and protection for the foot. 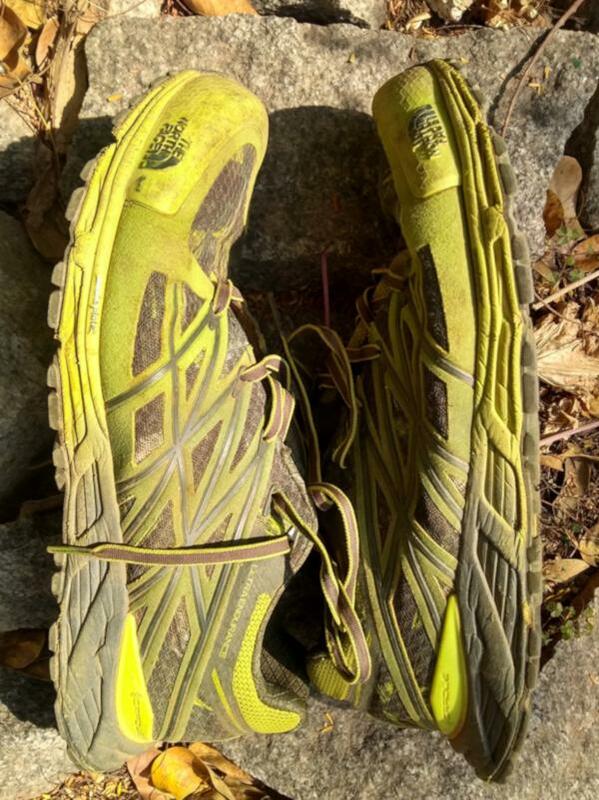 Several runners noted that the lugs worked well on slightly muddy trails, but not completely effective on a totally muddy environment as they carried the mud and weighed the shoe down. Some users mentioned that the Ultra Endurance had a poor drainage system as it took almost a mile to completely shed water. A number of users were disappointed with the shoe’s traction as it performed poorly on downhill trails. One buyer did not like the weight of the shoe and felt that it dragged the foot down. The upper was a bit too snug and narrow for some testers. The Ultra Endurance is a great trail-and-mountain shoe that transitions well between a multitude of surfaces. With the cushioning it provides, this shoe is not highly recommended for runners looking for a low-drop or a minimalist shoe. It may not be the lightest shoe on the market, but the cushioning, protection, and longevity on offer are enough to make it an overall attractive shoe. It was time for me to buy Ultra shoes, so I was going through many numbers of articles and reviews on new release. This was the one which caught my eye. These two aspects are the first things that attracted me the most. The manufacturer did a great job in it. Its perfect design and various colors automatically attract you to place it in the online kart. I have a wide forefoot and this shoe gives a very good hug to my feet. Wearing comfort is very good for a normal/wide foot (not for extra wide feet). The shape of the shoe gives better comfort than expected. This is really well designed for technical/difficult trail runs. It is very neatly designed sole for uphill and downhill climbs and runs. The anti-skid lugs really help you to not to skid and fall in any gradient. The lugs are perfectly designed and long enough for all terrains and kind of trails. I found it is good on the wet surface but little slippery on the wetter muddy or grass trails. I have been using these shoes for two years and have run many ultras. The sole and the material used for the shoe is enough to use for many miles/kilometers without any damage. The material used on the upper surface of the shoes is porous enough to keep your feet cool while running. For me, this shoe is a performer. I have completed four ultras in the same shoes. Can run 100 miles/161 km without changing the shoes and without any damage to your feet. This is a very good shoe for technical trails and wet surfaces. It has good cushioning while running on rocky trails. The heel to toe drop doesn’t matter much while running. You will feel little poor traction or shock while running in steep downhill trails. It supports slow, and fast-paced trail runs without any difference. The midsole cushioning is much better to push you to run comfortably. This shoe is designed in such a way that your feet is completely protected while running. The toe box is just in place to protect your fingers from tripping on stones/sharp edges. The feet are always protected from sharp stones or objects. No Skidding due to small stones or wet surfaced trails. TNF Ultra Endurance is a total worth buy shoe. Affordable and value for the money. I Can say it’s an allrounder for an intermediate ultra trail runner. This is a really well-designed shoe that performs. I have flat, wide feet with a tendency for posterior tibial tendonitis (PTT). My ankle flared up in these shoes after a few miles. This shoe is a great all-rounder and may well be a perfect ‘one shoe’ purchase for anyone who is looking for something that can do many things well. It excels on dry trails and loose surfaces such as scree, stones, sand etc. The Ultra Endurance is a trail running shoe with a stack height that starts high around the midfoot and lowers around the forefoot, allowing for a good ride. This design is aimed toward neutral pronators, and its purpose is to ensure a stable platform for landing and pushing off while running on uneven terrain. It is a simple and straightforward trainer with a rugged upper and sole that is built to deal with tough terrain and extreme running. The Vibram Megagrip outsole is designed to be reliable on any terrain and under any weather condition, but it performs especially well on wet surfaces. It has a lightweight finish, but not at the expense of foot protection. The shoe is a neutral, varied-terrain shoe that runs true to size. When worn, it is intended to feel light yet tough on the foot. It also possesses a toe room that satisfies both length and width, thus catering to all foot volumes. Width profiles available are D – Medium for men and B – Medium for women. The Ultra Endurance uses a single-piece Vibram Megagrip outsole for a durable and sticky traction that can withstand any condition. Neither too soft or too rigid, it allows the shoe to provide comfort and a decent ride on long-distance trails without the loss of ground feel. This outsole material is also used in the Ultra Endurance 2 and other running shoes from The North Face. Featuring 5-mm multidirectional arrow-shaped lugs made of sticky rubber, the outsole delivers a grip suitable for upward and downward slopes. The outsole guarantees sure-footedness as the lugs allow a good grip on different surfaces such as mud, dirt, snow, and wet and dry rocks, and transitions well from wet to dry trail and back again. With a stack height that runs high at the midfoot and low at the forefoot, there is an excellent underfoot protection resulting from a combination of good traction and stability. Forefoot protection is promoted using the ESS Snake Plate™, a rock plate made from EVA that protects the foot against sharp rocks and impact. It provides a balance between foot protection and great underfoot feel. The midsole of the Ultra Endurance is made of single-density, compression-molded EVA that brings adequate cushioning and a responsive ride. At the back of the midsole is the Ultra Protect™ CRADLE™ that is a heel-stability technology aiming to support and cushion the foot. It is specially-engineered to absorb impact and promote an anatomically correct stride by supporting the perimeter of the heel. Resulting in a smoother heel-to-toe transition, this feature is especially appealing to heel strikers yet it’s beneficial to all types of runners. The shoe also provides an Ortholite footbed that is breathable and shock-absorbing while providing comfort. With its neutral fit, runners can insert customized orthotic insoles if preferred. The upper is a breathable mesh made of welded TPU that is reliable, durable, and protective. It holds the foot in place well during sidehill and downhill runs. With its lightweight and seamless finish, there is a reduced chance of rubbing, hot spots, or blisters. The TPU suede overlays are structured so that rugged terrains are less challenging, while also being flexible to provide support as they wrap the foot snugly. The overlays strengthen the upper. They help protect the sides of the foot while ensuring that the mesh does not rip. The toe cap is also made of TPU to provide substantial protection to the toes. It is reinforced so that the shoe can handle collisions with rocks, stones, and other debris without significant damage to the toes. The inside of the collar in the upper consists of the FlashDry™ lining, which is a piece of fabric made to accelerate the removal of moisture from the skin and speed up drying. It does not add weight to the shoe and is designed to never wear out. The comfort level provided by FlashDry™ allows the runner to wear the shoe even without a sock. There is a padded heel collar to hold the foot securely in place and a gusseted tongue to support the ankle while keeping debris from entering the shoe.